A Soldier’s Life is delightful and will have appeal to general readers, and I know that scholars will find it extremely useful. Murphy Givens, Jim Moloney and the Nueces Press have done a tremendous service in making this long-lost manuscript available. Daniel P. Whiting’s commentary on his experiences in the Second Seminole War, the war against Mexico, the Mormon expedition, and most particularly the relationships between soldiers and civilians in the antebellum United States offer invaluable insights into the nation’s military experience. It also offers a unique perspective on a widowed father’s attempt to raise his children. 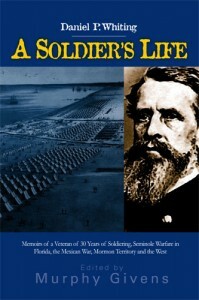 A Soldier’s Life has some unique insights into mid-nineteenth century America, and deserves a broad audience. I know that I would have benefited from it in writing my last book, and hope to be able to use it as I continue working on the present one.